Rutland is a county of mainland England, bounded on the west and north by Leicestershire, northeast by Lincolnshire, and southeast by Peterborough (a unitary authority in Cambridgeshire) and Northamptonshire. Its greatest length north to south is only 18 miles (29.0 km), greatest breadth east to west, 17 miles (27.4 km). It is the smallest (in terms of population) normal unitary authority in mainland England (only the City of London is smaller), and is 348th of the 354 districts in terms of population. It is traditionally called the smallest English county, although the Isle of Wight, the City of London, and Bristol are all counties and all smaller in area. The only towns in Rutland are Oakham, the county town, and Uppingham. At the centre of the county is the large reservoir Rutland Water, with a similar surface area to Windermere, and it is an important nature reserve serving as an overwintering site for wildfowl and is a breeding site for ospreys. The town of Stamford is just over the border in a protruding part of Lincolnshire. Rutland's older cottages are built from limestone or ironstone and many have roofs of Collyweston slate or thatch. The county used to supply iron ore to Corby steel works but these quarries closed in the 1960s. Agriculture thrives with much wheat farming on the rich soil. Tourism continues to grow. Earl of Rutland and Duke of Rutland are titles in the peerage of England, derived from the historic county of Rutland. The Earl of Rutland was elevated to the status of Duke in 1703 and the titles were merged. The family seat is at Belvoir Castle. Rutland covered parts of three poor law unions and rural sanitary districts : those of Oakham, Uppingham and Stamford. The registration county of Rutland contained the entirety of Oakham and Uppingham RSDs, which included several parishes in Leicestershire and Northamptonshire – the eastern part in Stamford RSD was included in the Lincolnshire registration county. In 1894 under the Local Government Act 1894 the rural sanitary districts were partitioned along county boundaries to form three rural districts. The part of Oakham and Uppingham RSDs in Rutland formed the Oakham Rural District and Uppingham Rural District, with the two parishes from Oakham RSD in Leicestershire becoming part of the Melton Mowbray Rural District, the 9 parishes of Uppingham RSD in Leicestershire becoming the Hallaton Rural District, and the 6 parishes of Uppingham RSD in Northamptonshire becoming Gretton Rural District. Meanwhile, that part of Stamford RSD in Rutland became the Ketton Rural District. Rutland was included in the "East Midlands General Review Area" of the 1958–67 Local Government Commission for England. Draft recommendations would have seen Rutland split, with Ketton Rural District going along with Stamford to a new administrative county of Cambridgeshire, and the western part be added to Leicestershire. The final proposals were less radical and instead proposed that Rutland become a single rural district within the administrative county of Leicestershire. This victory was to prove only temporary, with Rutland being included in the new non-metropolitan county of Leicestershire under the Local Government Act 1972, from April 1, 1974. Under proposals for non-metropolitan districts Rutland would have been paired with what now constitutes the Melton district – the revised and implemented proposals made Rutland a standalone non-metropolitan district (breaking the 40,000 minimum population barrier). In 1994, the Local Government Commission for England, which was conducting a structural review of English local government, recommended that Rutland become a unitary authority. This was implemented on April 1, 1997, with Rutland regaining a separate Lieutenancy and shrievalty as well as its council regaining control of county functions such as education and social services. Royal Mail included Rutland in the Leicestershire postal county in 1974. After a lengthy and well organised campaign, and despite a code of practice which excludes amendments to former postal counties, the Royal Mail agreed to create a postal county of Rutland in 2007. This was achieved in January 2008 by amending the former postal county for all of the Oakham (LE15) post town and a small part of the Market Harborough (LE16) post town. The council remained formally a non-metropolitan district council, with wards rather than electoral divisions, but has renamed the district to 'Rutland County Council' to allow it to use that name. This means the full legal name of the council is Rutland County Council District Council. Under the Poor Laws, Oakham Union workhouse was built in 1836–7 at a site to the north-east of the town, with room for 100 paupers. The building later operated as the Catmose Vale Hospital, and now forms part of the Oakham School. Workhouses website. The origin of the name of the county is unclear. In a 1909 edition of "Notes and Queries" Harriot Tabor suggested "that the name should be Ruthland, and that there is a part of Essex called the Ruth, and that the ancient holders of it were called Ruthlanders, since altered to Rutland", however responses suggest "that Rutland, as a name, was earlier than the Norman Conquest. Its first mention, as "Roteland", occurs in the will of King Edward the Confessor ; in Domesday it is " the King's soc of Roteland", not being then a shire; and in the reign of John it was assigned as a dowry to Queen Isabella." 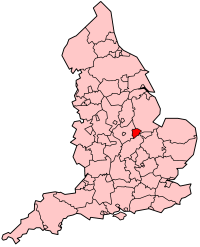 The northwestern part of the county was recorded as Rutland, a detached part of Nottinghamshire, in the Domesday Book; the south-eastern part as the wapentake of Wicelsea in Northamptonshire. It was first mentioned as a separate county in 1159, but as late as the 14th century it was referred to as the 'Soke of Rutland'. Historically it was also known as Rutlandshire, but in recent times only the shorter name is common. Rutland may be from Old English hryþr/ hrythr "cattle" and land "land", as a record from 1128 as Ritelanede shows. The population in the 2001 Census was 34,560 a rise of 4% on the 1991 total of 33,228. This is a population density of 87 people per square kilometre. 1.9% of the population are from ethnic minority backgrounds compared to 9.1% nationally. In December 2006, Sport England published a survey which revealed that residents of Rutland were the 6th most active in England in sports and other fitness activities. 27.4% of the population participate at least 3 times a week for 30 minutes. Rutland is the county in England with the highest Total Fertility Rate at 2.81. There are 26 councillors representing 16 wards on Rutland County Council (unitary authority). The particular geology of the area has given its name to the Rutland Formation which was formed from muds and sand carried down by rivers and occurring as bands of different colours, each with many fossil shells at the bottom. At the bottom of the Rutland Formation is a bed of dirty white sandy silt. Under the Rutland Formation is a formation called the Lincolnshire Limestone. The best exposure of this limestone (and also the Rutland Formation) is at the Castle Cement quarry just outside Ketton. 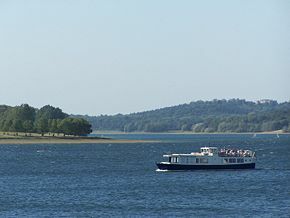 Rutland is dominated by Rutland Water, a large artificial lake formerly known "Empingham Reservoir", in the middle of the county, which is almost bisected by a large spit of land. The west part is in the Vale of Catmose. Oakham itself is built on an incline, and varies from 99m above sea level (Ladywell area) to 122m above sea level (Brooke School area). There are 17,000 people of working age in Rutland, of which the highest percentage (30.8%) work in Public Administration, Education and Health, closely followed by 29.7% in Distribution, Hotels and Restaurants and 16.7% in Manufacturing industries. Significant employers include Lands' End in Oakham and Castle Cement in Ketton. It is 348th out of 354 on the Indices of Deprivation for England, showing it to be one of the least deprived areas in the country. The Ruddles brewery was Langham's biggest industry until the brewery was closed in 1997. In March 2007 Rutland became only the fourth Fairtrade County. Other employers in Rutland include two Ministry of Defence bases - RAF Cottesmore and St George's Barracks (previously RAF North Luffenham), two public schools - Oakham and Uppingham - and two prisons - Ashwell and Stocken. This is a chart of trend of regional gross value added of the non-metropolitan county of Leicestershire and Rutland at current basic prices published (pp.240-253) by Office for National Statistics with figures in millions of British Pounds Sterling. 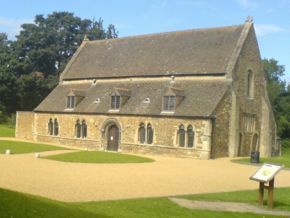 The castle in Oakham is little more than an old Great Hall, but features a large collection of horseshoes. These have been presented over the years by royalty, and some are significantly more elaborate than others. 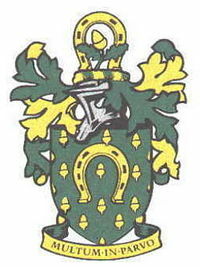 The horseshoe features prominently on the county coat of arms. Rutlanders were proverbially called Raddlemen. The events in several Peter F Hamilton books (like Misspent Youth and Mindstar Rising) are situated in Rutland, where the author lives. The county's small size has led to a number of joke references such as Rutland Weekend Television, a television series hosted by Eric Idle. In the first episode of the British comedy series Blackadder, the title character claims that if he loses a battle "I'll be chopped to pieces ... my genitalia stuck up a tree somewhere in Rutland". From this point on, there are continuous references to this notion. When the ocean's tide is out, the Isle of Wight becomes the larger of the two counties, making Rutland the smallest. When the tide is in, the Isle of Wight becomes the smallest. This means that the Isle of Wight is the smallest county half of the year, and Rutland is the smallest county the other half of the year. Rutland has many varied traditions. Uppingham Market was granted by Charter in 1281 by Edward I. The above Colleges are for pupils in years 7-11 (ages 11-16), they are not FE or Sixth Form colleges.